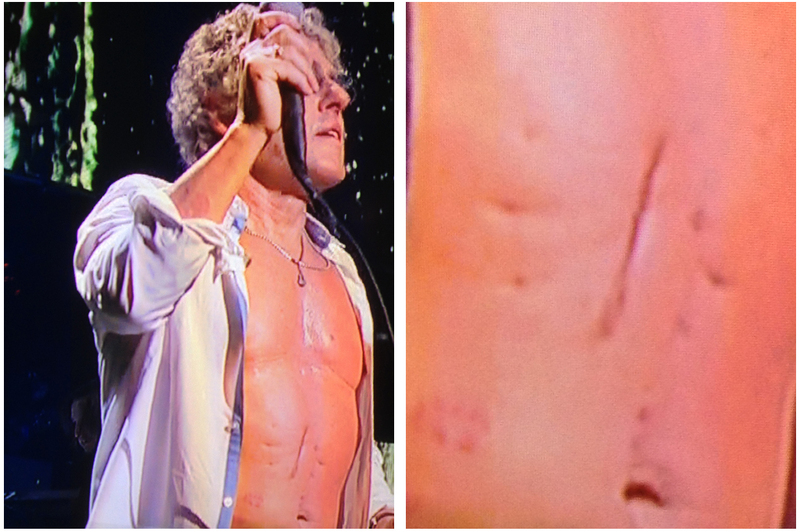 After watching The Who rock the 12.12.12 Hurricane Sandy Concert, many people have been searching the words “Roger Daltrey Stomach Scar“. At the benefit concert, Daltrey decided to pop his shirt open and show off his ripped 68 year old chest that revealed a strange looking stomach scar. The scar has been with Daltrey since the age of three, when he swallowed a rusty nail that had to be surgically removed and thus left the visible scar. At the age of five, the rust from the nail caused an ulcer in his stomach which again required him to be hospitalized. You can see from earlier photos of Daltrey that he has always had the scar.